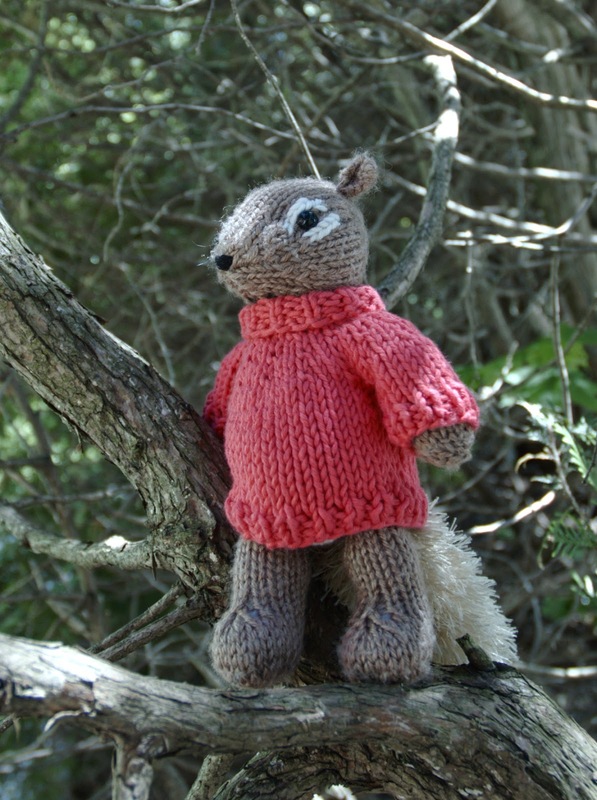 My original Squirrel knitting pattern came with a turtle-neck sweater, which was very simple - back and front knit the same, then sleeves picked up and knit straight. Boxy and plain, a bit awkward to sew together, and ill-fitting for the shape of the toy. But the Squirrel was one of my first patterns, and I had to start somewhere! When I updated the pattern for my Festive Knits collection, I included overalls instead of the sweater, because I thought they looked much cuter, and they fit a lot better. I had always intended to publish the original turtle-neck sweater as a free pattern, but procrastinated because I was really not happy with the design. 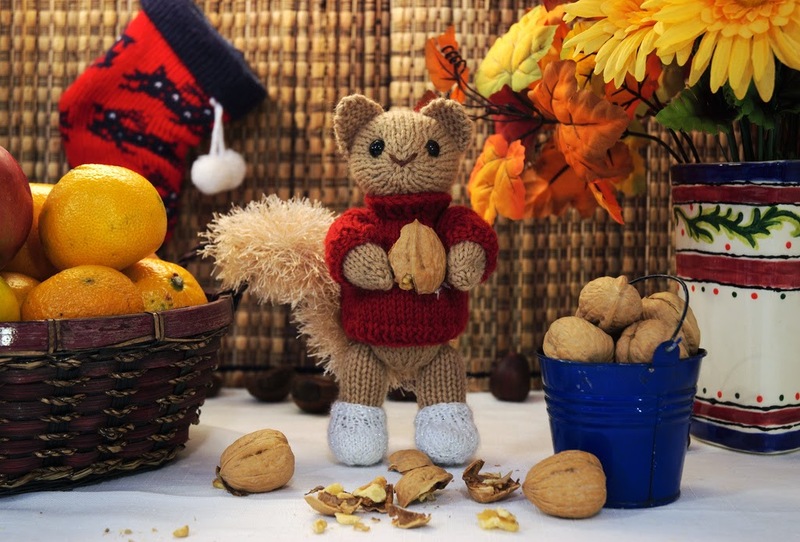 However, featuring the Squirrel pattern this month seemed like the perfect opportunity to update that poor sweater, and offer you a little something to dress-up your squirrels (and other toys). While it looks similar to the original, this polo-neck pullover is completely new (hence the new name): it's knit in the round from the top down, and is completely seamless. The only sewing you need to do is weaving in ends, and closing some small holes under the arms. It knits up in under 2 hours, so you can make one in an evening, enjoying a good movie! The length of the body and arms is easy to adjust, so you can make it fit any of my various small toys. The estimate of 25 g of yarn is generous, so it's a good way to use up some left-over yarn. I hope you enjoy this pattern, and maybe knit a little squirrel to go with it! CO 24 sts. Distribute sts evenly on 3 of your dpns. Rnd 1: Join in the round, [k1, p1] to end. Rnd 2-8: [k1, p1] to end. Rnd 9-10: Knit 2 rnds. Rnd 12-13: Knit 2 rnds. Rnd 15-16: Knit 2 rnds. Rnd 18: Place 16 sts on scrap yarn for Left Sleeve, k22 sts for Front, place next 16 sts on scrap yarn for Right Sleeve, k18 sts for Back. Continue below for Body of Pullover. Redistribute sts on dpns if necessary. Rnd 20-21: Knit 2 rnds. Next 2 rnds: [k1, p1] to end. Bind off loosely in ribbing pattern. Place sts for one sleeve on 3 of your dpns, distributing the sts as evenly as possible. Weave in all yarn ends, making sure to close holes at the underarm. Block finished pullover. You may notice the toy is the Chipmunk, not the Squirrel. I didn't have a Squirrel toy to use in the photos. 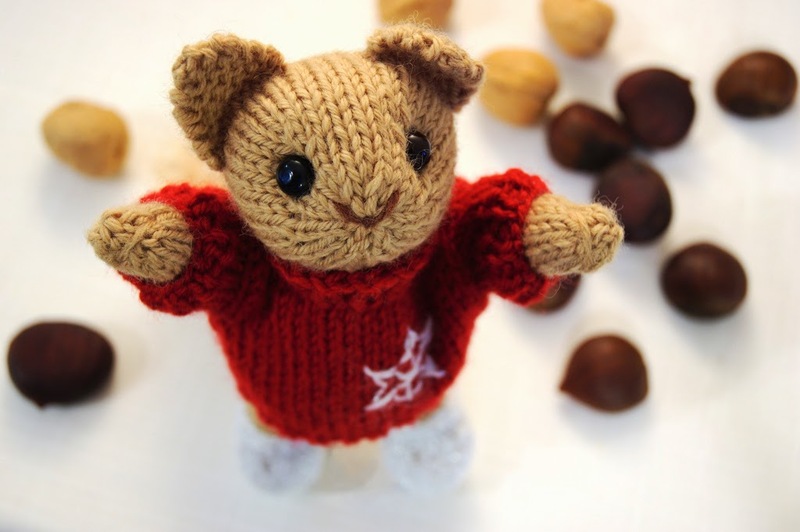 For the month of May, I've decided to feature one of my first toy patterns - the Squirrel. 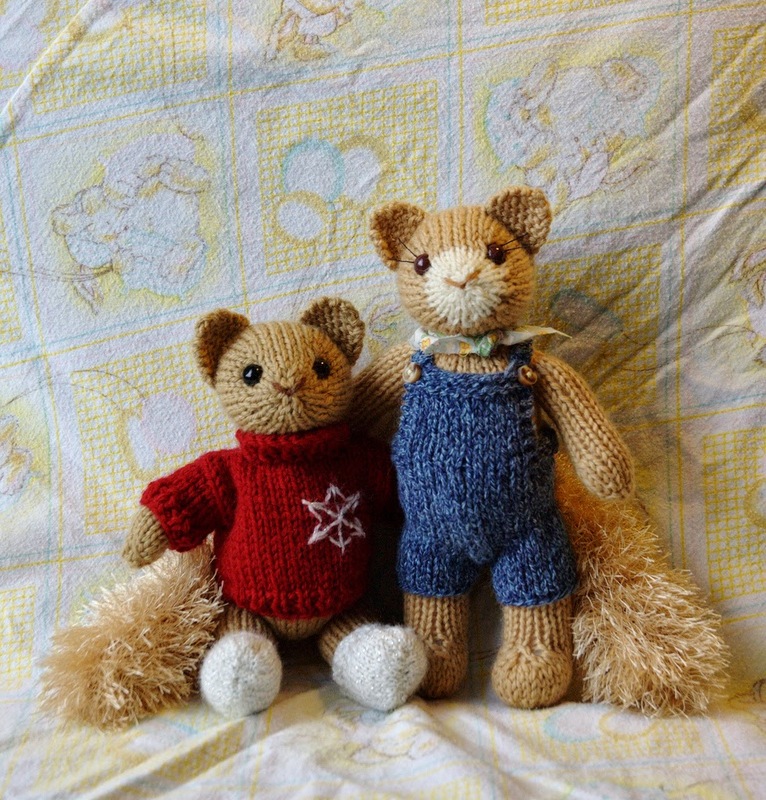 I knit a lot of toys in the first few months after starting Fuzzy Mitten, but the squirrel was my favourite. We liked him so much, he was the model my husband used to design my logo. I found some eyelash yarn at a dollar-store, in a colour that I thought would work well for a squirrel. He turned out so adorable, I carried him around in my bag for a couple of months, so I could show him to everyone! Sadly, at that time I had to sell all my toys, in order to buy yarn to make more. I don't remember where Wally the squirrel ended up, but I still miss him. I knit a few others over the years, mostly as custom orders. Although the pattern originally included a turtle-neck pullover, I really liked how the squirrel looked in overalls (dungarees). When I was putting together my Festive Knits collection, I decided to change the pattern to include overalls instead of the pullover. This is one of my easier patterns and a great first project, if you haven't tried one of my designs before. It's also simple to modify, if you prefer to knit the pieces in the round. 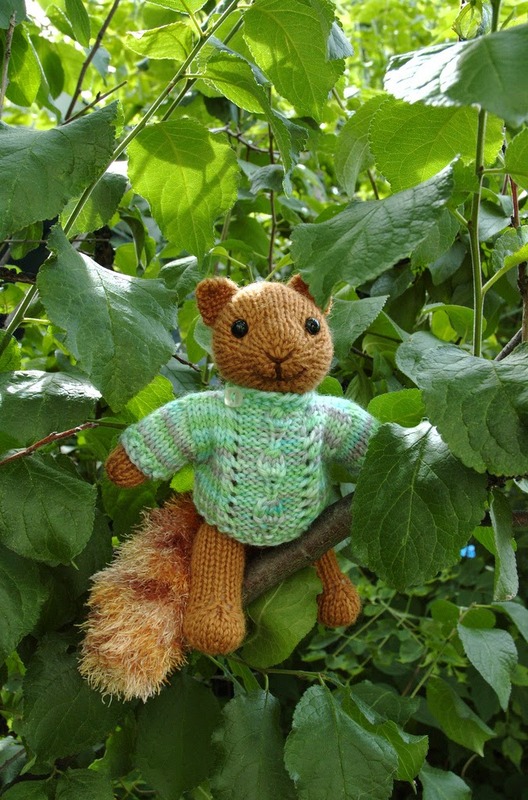 Squirrels come in many colours (the ones around here range from tan, to grey, to black, and we have tiny red squirrels too), so the toy is a good way to stash-bust some worsted or DK weight yarn. Eyelash or fringe yarn is still available, although not as popular as it used to be, and is so perfect for the tail! If you can't find eyelash yarn, use something fuzzy, and brush it out to make it even fluffier (I use a wire pet brush for this). 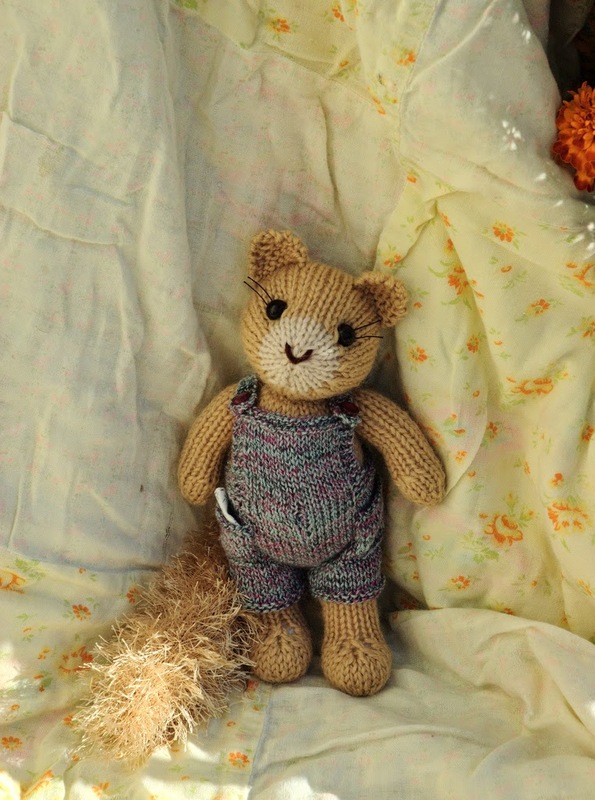 The overalls are also fairly easy to knit, although they require a bit of assembly. You can find the pattern for the slippers in an older blog post. 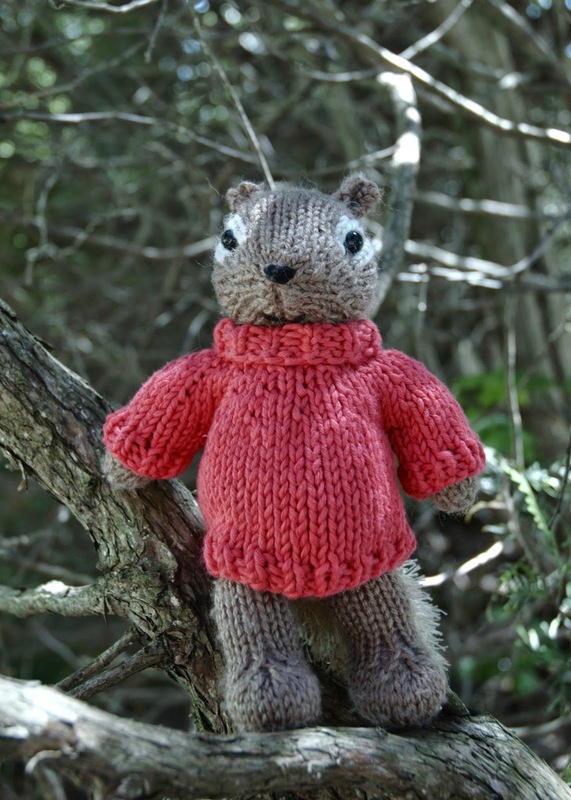 As with my previous featured patterns, the Squirrel will be 50% off for the month of May. You can find it in both my Ravelry and Etsy shops. There is also a knit-along in my Ravelry group, if you want to see what other people are making.